Great stuff! Colin's new backpack sounds brilliant. He's a very inventive bloke. I was already very impressed by his tarp, which always looks to me like a praying mantis :) And 3kg for the trip? Just amazing! Colin has pointed out that the pack is 93 grams and the tarp 550 grams (he had a fitted groundsheet with it on the TGoO Challenge, which brought the weight up to 635 Grams). I've corrected the post. Great Stuff Chris, I've been looking at Tarps (more accurately Tarptents) for summer use. The thing I can't get past though is that once you add a groundsheet/bivvybag it's geting close to the weight of a Laser Photon/Comp so is there some other advantage? Genuinely interested, not trying to start a Tarp v's Tent argument. I am not at Colin's level for going SUL having found a nice balance between comfort and streamline. I like tarps because of the contact you still have with the outdoors - you're not sealed off from it as in a tent (which is also why I prefer a tent in midge season - I don't want contact with that aspect of nature!). I also like being able to pitch tarps in different ways depending on conditions. A tarp/groundsheet at the same weight as the Photon would provide much more room. I've mostly used tarps that can be pitched down to the ground and not bothered with bivi bags. Tarptents covers a range of designs (and of course a brand name) - some are basically just flysheets, others are single-skin tents. I reckon they're much closer to tents than tarps. Re the whole tarp experience, for me there is no finer thing than waking up in the morning with the sun and breeze on your face. It was the Tarptent Contrail I'd been looking at, close to a single skin tent really. 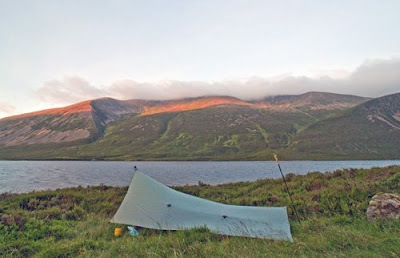 The nidge aspect is the thing that bothers me, I'd be looking at using a Tarp(tent)in summer which unfortunately when the midges are at their worst. That said the Contrail can be pretty open if circumstances (and midges) permit. I suppose the obvious answer would be to make my own using the plans on Henry Shires (Tarptent) website to see if it would work for me. I am genuinely impressed by people who make their own gear - especially at such absurdly light weights. It's amazing stuff. To be honest I find much of the debate about lightweight backpacking a little bit dull. A fair bit of going lighter really depends upon how how much you are prepared to shell out for new products as they come on the market. I am sure I could shave a kilo off my pack if I opted to spend £1,000 to replace the Laser Comp with a Photon, change pack, sleeping bag etc. But this approach is very different and really inspiring. That tarp isn’t the lightest but in a storm like on Saturday I was glad of its bulk! Also note that the weight is the trail weight and includes bivvy bag, pegs, guys etc so it’s still usefully lighter than a Photon and probably a more stable option in a storm. I do use lighter tarps in guaranteed good weather but at other times I prefer its reliability. "11kg is quite a light load for me and I only noticed the weight when climbing steeply"
Without wishing to denigrate the lightweight fraternity, I would guess that many regular backpackers would echo this comment, and not really be stressed by anything under 15kg or so. We have certainly come across a number of TGO Challengers in their 70's who move very well with such loads. Remember that most of us wait until our old gear wears out before upgrading it with the assistance of Chris's reviews. Carrying 10 to 15 kilos is not exactly difficult or stressful! Colin's fanaticism has to be wondered at, though! Martin, the question of how the weight affects what you can do is an interesting one. There are many Challengers who say they take low level routes and don't climb Munros because of the weight of their packs. I met a couple on Braeriach a few weeks ago looking longingly at Cairn Toul, which they didn't have time to climb. They said they'd considered an overnight trip but their packs were too heavy. They were astonished that I was backpacking due to the smallness of my pack. For people like this going lighter would clearly be a benefit. I think though that this means dropping from 15-25kg loads to 10-15kg loads rather than going superultralight. I have an interesting book called Long-Distance Hiking: Lessons from the Appalachian Trail by Roland Mueser in which the author surveys AT hikers. The AT has many steep climbs so it is an arduous hike. Mueser found that the cutoff point for the difference pack weight makes was 30lbs (13.6kg). Hikers with packs weighing less than that averaged 14.5 miles per day, those carrying more averaged 17 miles per day. At the end of the day, it what people are comfortable with that's important. I personally couldnt face strapping a rucksack bigger than say 50L and 6-8kg onto my back as a maximum these days but then I have gotten used to being lightweight. Anyway, quick question for Chris, unless I missed it elsewhere, what tent were you testing on the trip? Dave, it was a Terra Nova Superlite Voyager. can I ask how you got on with it or is it hush-hush for an article/review in TGO? Oh, it performed fine. It'll appear in the September TGO in a review of two person tents. I have soft spot for the Voyager as I used one of the original ones on my Continental Divide walk in 1985! That one weighed about 2.5kg. The Superlite weighs 1.6k. On Pack weights: I think the cut-off weight at which an individual feels comfortable varies greatly from individual to individual.I don't like fixed cut off points for that reason. It has to do with a lot of factors, physiology and fitness as well as backpacking style and ambition. In my case I am not happy with loads of 15kg and strive to keep the weight of my pack below 12kg preferably 10kg. For me, there is a world of difference between 15 and 12kg. A difference measurable in terms of enjoyment and comfort as well as achievment. High level routes have my preference and that plays a big role in where I draw my line. "UK proof" and what it is you think makes the MLD in its raw state unsuitable? Dave, I agree the cut-off point depends on the individual. And on the terrain. Mueser's 30lb cutoff was based on the actual experience of AT hikers rather than any theory. I've always preferred high level routes in Scotland, because that's where the wildest land is. If necessary I'll carry 20+kg but below 15 is my preference (all up weight including food). Sometimes on long hikes abroad I carry 10 days food, which means a heavy starting load. On the Arizona Trail I carried three gallons of water at times. It all depends on where you want to go and what you want to do. I'll let Colin comment on the Grace tarp, if he wants to. I've never seen an original, only Colin's modified, but the lack of side guys would concern me, given my experience with other tarps. Colin added two on each side. Dave I'm away in the Lakes for a week so will answer your question when I return (using mobile to do this). I agree with your comments about weight, Chris, but I think there's also a pschological element. Faced with a week or more between provisioning, in high mountains, with the most basic of shops to buy supplies, it's difficult to comply with the weight limits some of your correspondents seem to have set themselves. Those (like yourself) that have experienced the virtues of such routes will recognise that the heavy weight can be regarded as a minor inconvenience that diminishes as the days pass. Martin: The limit I set myself is based on hard won personal experience. For some, heavier weights may ammount only to a minor inconvenience. For others the negatives may weigh far heavier. I don't think either of us can speak for anyone else on this subject. Neither do I think can one talk about generic weight limits. The weight limit I set myself means that the week long routes you talk of are beyond me. That's something I have to accept. I now plan routes of 4-5 days unsupported and never have more than 12kg on my back, and can be confident I can cover whatever technical ground I encounter saftely. My motivation for lightening my load further is simple. Each kg I can loose from my baseweight equates to an extra day unsupported travel. As I work to lighten my load more, and more spectacular, routes open up to me. That Superlite Voyager sounds pretty fantastic. I loved my Voyager more than any tent I've ever had, and at 1.6kg I'd even think about carrying it in place of my Laser Competition (shock, horror! *g*), the loveliness and comfort of it quite possibly making up for the additional weight. Very much looking forward to reading the review. I have a soft spot for the Voyager too - having carried one the length of the Continental Divide back in 1985! I don't think inner first is a disadvanatge. You just have to adapt to how you pitch the tent in the rain. The Voyager pitches fast so it would have to be a torrential downpour for the inner to get wet. Wow, 3kg for an overnighter, that's quite impressive. I hope to get my base weight down to 5kg this summer/ autumn, and after that will consider MYOG. Are there any photos of Colin's MYOG backpack, or maybe even a tutorial? Hi Hendrik, there are no photos or info on Colin's pack yet as it's still a design in progress. I expect there will be eventually.